One of the most anxiety inducing things I can think of for myself is blind baking a tart crust. Last fall there was a time I was recipe testing for a video shoot and made a tart crust 7 different times. Yes, seven different times. Half of the time they failed - either the edges sliding down the sides while baking, or while rolling out the dough getting huge cracks and tears in it, or when transferring the dough to the tart pan, ripping the dough, to which I would utter a bad word and then try to patch up with my fingers, only to bake it and it result in a huge gaping whole in the middle. And then, more bad words would elicit after that. It took nearly 3 weeks but thankfully, on the day of filming, everything worked out perfectly. It can only be described as a literal miracle from above. After the tart dough experience, instead of being turned off by it, I was angry and challenged. Why was this so difficult to master for me? So then, over the next month, I preceded to make more dough, except in the form of pie dough. I think last November I made like 5 or 6 pies! While my tart or pie dough skills still aren't near perfect (as you can see in the above photo, the edges are not clean), I am a lot more confident in it by now. I understand dough is a tricky thing to work with: the butter needs to be chilled enough, there should be enough water to hydrate the dough but not make it too wet, and everything should be done quickly and efficiently before butter gets too warm. All this rambling to say, this tart is the easiest tart I can think of, which was much needed for the anxiety that plagued my mind when wanting to make a tart for this space. The tart dough is a little tricky if you have not worked with it before, I will admit, but if yours isn't perfect it's okay because it will be hidden with the filling. Oh my, can we finally talk about this filling?! Creamy and smooth, tart from the grapefruit but just sweet enough, and so so simple. I wanted to use coconut milk instead of the regular heavy cream for the panna cotta because it is lighter and I love the flavor of coconut paired with the citrus. Plus, it's pink! 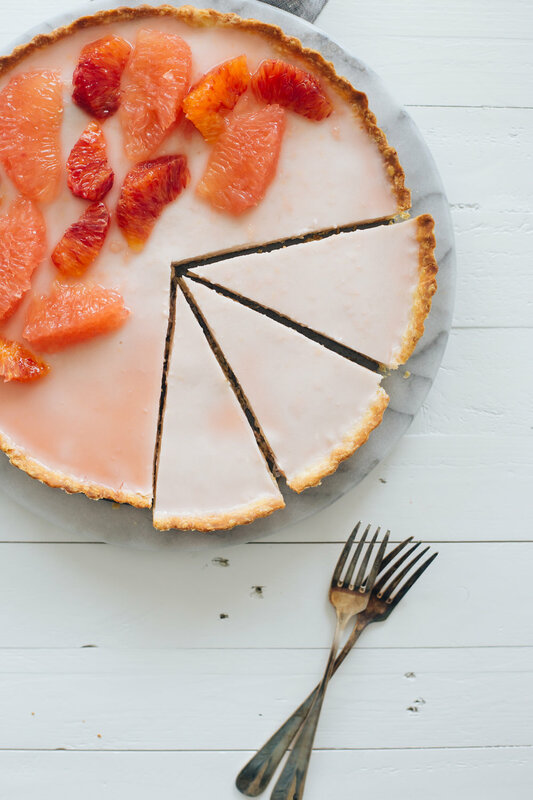 If you want to try something different for Valentine's that isn't chocolate, maybe give this citrus tart a try. It can be made the day ahead, and kept in the refrigerator overnight. Whisk together the sugar, salt and flour in a large bowl. Cut in the butter with a pastry cutter or by hand, until butter is the size of peas and distributed throughout the flour. Add the egg, and mix together with a fork until dough comes together. Dump out dough onto a lightly floured surface (it’s okay if dough is crumbly at this point). Knead a couple of times until dough comes together, and shape into a flat disk. Wrap in plastic wrap, and let chill in the refrigerator for at least 2 hours or overnight. Take dough out of refrigerator and let sit for 5 - 10 minutes to soften slightly. On a lightly floured surface, roll out the dough until slightly larger than your tart pan*, making sure there is enough room for some overhang on the edges. Transfer the dough to the tart pan by rolling the dough around the rolling pin, and unrolling on top of the tart pan. Press edges into tart pan and cut off excess. Dock center of tart with a fork. Carefully transfer to the freezer for 30 minutes. Take tart out of freezer and cover with parchment paper and fill with pie weights (or dried beans). Bake tart in preheated oven for about 15 minutes. Carefully remove parchment paper and pie weights and bake for an additional 10 minutes, or until shell is golden brown on top. Let cool completely. To make the filling, combine the gelatin and grapefruit juice in a medium bowl. Set aside to allow gelatin to bloom, about 5 - 10 minutes. Meanwhile, in a small saucepan, bring the coconut cream, sugar, and salt to a simmer. Stir until sugar is dissolved, about 5 minutes. Stir in the vanilla. Gradually whisk the grapefruit gelatin mixture into the coconut cream mixture until fully combined. Carefully pour filling into the cooled tart, and transfer to the refrigerator. Let sit in the refrigerator for at least 4 hours or preferably overnight. When ready to serve, top with fresh citrus wedges, reserving any juice to pour on top.